This is what a rain expert looks like! The new RainExpert is the perfect choice for compact cars. Great protection against aquaplaning, short stopping distances and a long life - impressive qualities. Double-concave shaped grooves for improved water dispersion. The double-concave shaped grooves and increased groove volume in the tread centre promotes smooth water flow through the grooves and improves water dispersion. 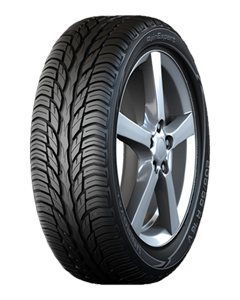 Directional sipes in the tyre shoulders and tread centre provides improved support when braking, resulting in shorter stopping distances in both the wet and dry. There are three indicators on both the inner and outer shoulder. Incorrect track alignment and/or camber settings are identified if the indicator grooves on both shoulders are unevenly worn. Poor wheel alignment can be identified and rectified early, thus achieving a higher mileage through avoiding uneven wear.